Negative attention biases (AB) may play a causal role in the development of emotional disorders. In order to examine this proposed causal role, researchers have developed Attention Bias Modification (ABM) paradigms to experimentally induce or reduce AB. To date, most ABM studies have been based on modified dot-probe tasks. However, this task is only moderately successful in changing patterns of AB. In two laboratory-based experiments, we explored the effects of a novel visual search ABM paradigm, called “Intrinsically-Motivating Playable Attentional Control Training”, on AB processes and mood in undergraduate participants. 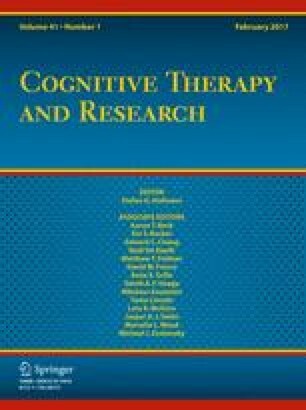 Motivation was fostered by active task involvement (i.e., searching for target faces while ignoring irrelevant faces) and gamification techniques. In both experiments, training performance significantly improved, but failed to transfer to attention and mood measures. Possible explanations for the failure to find transfer effects are discussed. The online version of this article (doi: 10.1007/s10608-016-9803-z) contains supplementary material, which is available to authorized users. This study was funded by a Special Research Funds of Ghent University (BOF10/GOA/014). The programming of the IMPACT task was supported by a grant from the Milton Fund of Harvard Medical School. Elien K. Pieters, Rudi De Raedt, Philip M. Enock, Laura M. S. De Putter, Howard Braham, Richard J. McNally, Ernst H. W. Koster declare that they have no conflict of interest. Informed consent was obtained from each participant in the study.